Scan to PDF, Word, image, etc… by just pressing one button! When launching IRIScan Express 4 (USB portable scanner), IRIS introduced the new version of its flagship scanning “button manager”. This magic piece of technology was built to let you scan any document, convert it to the format of your choice and export it in your preferred destination by just pushing one single button. In other words, it lets you scan, convert and archive your documents at the push of a button – literally! – and without having to launch any software. Simply click on the process of your choice and close the software. That’s it! As from now, every time you press the button on your scanner, the software will open automatically. Just insert a document and press the button again to launch the scanning process. Create your own scanning process! IRIScan Express 4 scans pages one at a time but still allows you to create multi-page PDF files. Just select “Multi-page PDF” as file format in the button manager and when scanning, you will be asked if you want to append other pages to your current document. You will only be able to add pages scanned by the scanner; however should you want to add external pages to your PDF file, all you need to do is use the provided OCR software (Readiris 14). 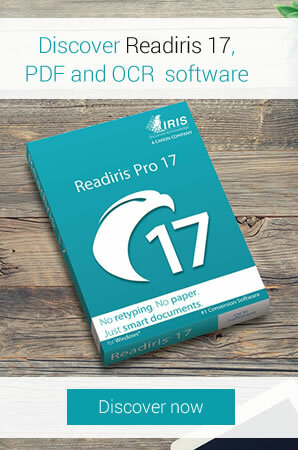 IRIScan Express 4 includes a powserful OCR software (Readiris Pro 14) that can converts your scanned documents into fully editable Word, Excel or PDF files. If you want to automatically launch Readiris 14 when scanning your documents, simply create a dedicated scanning process choosing Readiris as the scanning destination.